This is a video I created in 2008 to highlight some of the materials available in the collections here. It highlights some fairly amazing content and most of it hadn’t been available digitally before. The video highlights three of my favorite collections as listed below, but I include introductory text as taken from the site for each of the collections for background. 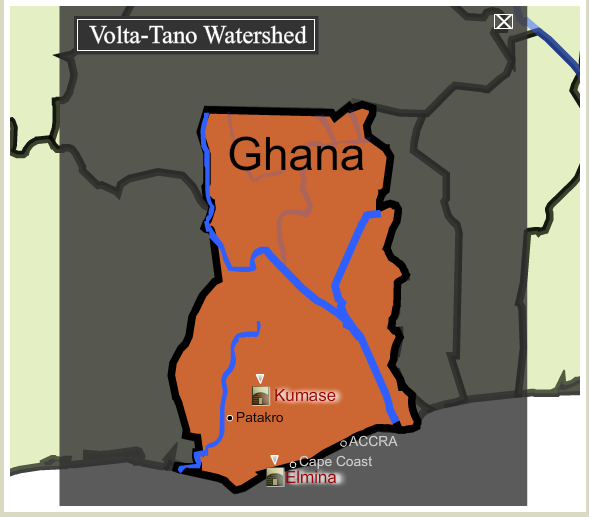 Starting with its inception in the late 17th century and its emergence as an independent confederacy of city-states, c. 1700, the Asante Kingdom kept detailed oral records of the founding of each of the constituent parts of its territorial and political bodies. The 18th century saw the continued growth of the kingdom’s military and economic power, as well as an expansion of its territorial boundaries. By the 19th century, the kingdom had become an empire and the Asante government developed a complex bureaucracy to meet its needs. The Ashanti Stool Histories, a two-volume, 1300-page collection is a history of the political offices developed within the Asante state from its beginnings as an upstart confederacy in the late 17th century to its height as a formidable 19th-century empire with a complex bureaucratic government. It is also the history of the officeholders, bureaucrats, and civil servants who, through inheritance or by appointment, worked within the Asante government. The term ‘stool’ was coined by the British to describe the intricately carved wooden Asante seats that, to this day, serve as symbols of political office and ritual observance. Originally existing primarily in oral form, the histories of these offices were collected and translated by Joseph Agyeman-Duah and were compiled by K. Ampom Darkwa and B. C. Obaka. Containing a wealth of information on the structure of the Asante political system as well as on the social history of the Asante people and their West African neighbours, this collection is indispensable for any Africanist anthropologist or historian and invaluable for any student of Asante history and culture. In 1806, the British colonised the Cape of Southern Africa, replacing the Dutch government. Previous to and continuing after this, Dutch farmers (trekboers) trekked north and east, expanding the colony since the late 17th century, and by the 1860s were living on the northern frontier beyond the reach of the law. They established farms by taking over the land of the indigenous San people (mainly the |xam), and hunted their game—for food, to be sure, but also for sport. The San were hunted, too, and along with the quagga, the ostriches, gemsbok, hartebeest, the eland, and the springbok died in the thousands. Those San who did not perish at the hands of the Dutch trekboers, or who were not abducted and made to work as labourers, were literally starved to death. In retaliation, gangs of San raided settler cattle and, in some cases, farmer aggression provoked homicidal attacks. The arrest of one of these gangs in the 1860s coincided, more or less, with the arrival of Prince Alfred in Cape Town. He tossed the first stones into Table Bay to initiate the building of the Cape Town harbour and of the convict station that would house the prisoners who would labour on its breakwater. Among these prisoners was the Tooren Gang, whose members were tried in October 1869 and each sentenced to two years’ hard labour. During this same period, the German philologist Wilhelm Heinrich Immanuel Bleek had set up home in Cape Town with his wife Jemima, later joined by her sister Lucy Catherine Lloyd. Bleek wanted to learn and describe a San language and travelled across Table Bay to Robben Island to interview captives there, but they were uncooperative and conditions were not ideal for establishing a rapport. Louis Anthing, magistrate of Namaqualand in the Cape and the first campaigner for |xam human rights, introduced Bleek to three captives brought in from the northern Cape for trial. It was from these men that Bleek compiled his first list of |xam words. Bleek was an intellectual and published scholar whose reputation had earned him the respect of the governor, who agreed to release |xam prisoners from work on the Cape Town breakwater into Bleek’s custody for the purposes of research. In 1870, the first member of the Tooren Gang was relocated to Bleek’s home where the process of teaching and learning the |xam language began. Lucy Lloyd joined Bleek in the project and together they collected a unique and expansive archive of stories, drawings, and watercolours. Several prisoners and other |xam speakers lived for varying periods of time in the Bleek home and after Bleek died in 1875, Lucy Lloyd and her sister Jemima continued to house and interview mainly |xam, but also several Korana, individuals, as well as four young !kun-speaking orphan boys who had come from northern Namibia to Cape Town in the late 1870s. The project resulted in more than 13 000 notebook pages of narrative as well as genealogies, maps, and illustrations of |xam and !kun observations of daily life. Today the |xam language is no longer spoken by a single person and the pages and images reproduced on this website are almost all that remain of the language and ideas of a people who once were the sole inhabitants of much of the central part of Southern Africa. The African Ceremonies Collection is a comprehensive selection of images covering more than 30 years of fieldwork carried out by U.S.-born Carol Beckwith and Australian Angela Fisher, two photographers who have dedicated their lives to recording traditional cultures throughout Africa. Their work has taken them to some of the most remote corners of the continent where they won the trust and support of people, thus gaining them access to sacred ceremonies and traditions little known to the outside world. The result is an unrivalled, joyful, and intimate photographic record of African traditional life. Images on this website are taken from these photographers’ universally acclaimed books. The Maasai of Kenya and Tanzania have made their way into the 21st century with their ancient customs preserved to an unusual extent. The photographs document their living story and vividly portray the traditional stages of life. Here are the feasts and ceremonies of the tribe; the daily work of maintaining the herds, beading skirts, and building huts and kraals; the warriors’ games, dances, and flirtations; and the elders’ quiet moments of contemplation. This study follows the Wodaabe of Niger—tall, handsome, nomadic desert dwellers in sub-Saharan Africa—through the cycle of a year, focussing on the herdsman Mokao and his family. The journey takes us to their dry season encampment, the well, the marketplace, and on their long northward rainy season migration, ending with the amazing round of dance pageants that culminate in the selection of their most handsome and charismatic young men. This seven-year study of jewellery and body decoration across the African continent illustrates the adornments of both everyday life and major ceremonial events. Among the peoples of Africa, even those who eke out a nomad’s existence, one sees objects of great beauty and style, often of extraordinary craftsmanship and great value—cast in gold or wrought in silver, inlaid with semi-precious stones, ivory, and coral. Jewellery is also often of important symbolic significance and can reveal a wealth of information about the wearer. For centuries, the Horn of Africa has sheltered an astonishing variety of human societies against the storms of the world. Images selected from this book include Amhara Christian and Falasha Jewish ceremonies of the Ethiopian highlands, Afar warriors’ dangerous ball games in the low-lying Rift Valley, ecstatic pilgrims at the shrines of Sheikh Hussein and the caves of Sof Omar, and extraordinary ‘jumping the bull’ and stick-fighting scenes in the Omo river region of Southwest Ethiopia. A 10-year field project documenting African rituals and rites of passage from birth to death across the continent, this landmark work portrays 93 ceremonies from 26 countries, including initiations, courtship and marriage, the coronation of an Ashanti king, healing practices, fantasy coffins, and voodoo rituals. It has won numerous awards, including the U.N. Award of Excellence ‘[f]or vision and understanding of the role of cultural traditions in the pursuit of world peace’. I am interested in khoisan websites,the ones I tried is not as informative,I am a student in history,and this my people! Hello there Louise! I am glad to hear that you enjoyed it. Are you based in Africa? Are you with a university or school? Those materials are available for free to all African institutions. If interested, contact participation@jstor.org. The Khoisan people have a wonderful history and hopefully these materials are useful to you. All my best, Louise! Thanks, James. There are some wonderful materials there that I just want to help see the light of day. It is important to establish Africa as a place of deep, deep historical significance to all of civilization; it has been embedded in our collective mindset as being a place that history just sort of happened to, rather than exerting quite a deal of influence on its progress. Ethiopia, in particular, is a good place to start as it encapsulates so much. The Beckwith and Fisher ceremonies collection materials are wonderful as well. So vivid. I’m a masters student in history and the Khoisan history is very interesting. That is wonderful to hear, Nomsa. Where are you studying? I am always curious to see where people study Africa. May you send me the differences and similarities between uncentralised and centralised political systems. Thank you.